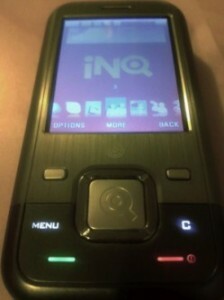 At its heart is the INQ1’s Facebook integration, which goes a little deeper than rival handsets. Along with a standalone app that resembles the social network’s mobile website, the phone’s camera software is capable of uploading directly to Facebook, and a user’s friends-list can be imported and synced with the INQ1’s address book. The latter feature opens up a world of possibilities. 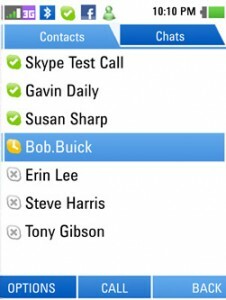 For example, when receiving a call, if available, the contact’s Facebook profile picture is displayed on the screen. Additionally, Facebook messages, pokes and friend requests are delivered automatically to the phone’s in-box, just like an SMS text message or ‘push’ email. In practice, this all worked a treat, and in many ways, makes staying up-to-date with friends and family through Facebook on the INQ1 feel more intuitive than on the desktop. The INQ1’s Skype client replicates the basic functionality of its older desktop sibling, with a few notable caveats. While Skype-to-Skype calls are permitted, along with IM, Skye-Out (calling regular phone numbers using paid-for Skype credit) is only available for international calling, presumably at the request of “3”, the only carrier that currently offers the INQ1. Like-wise, there’s no support for Skype-In or video conferencing. That said, similar to the device’s Facebook support, Skype contacts can be imported into and kept in-sync with the phone’s address book, from which you can see a contact’s Skype status, initiate a call or start an IM conversation. Any IMs or call requests received, even while Skype is running in the background, are pushed directly to the phone, again just like an SMS or regular call. In my testing, Skype call quality, while varied, was certainly good enough for social calls, which is exactly how the INQ1 is intended to be used, and the ability to see a contact’s status and, optionally, exchange a few IMs before calling, is very appealing. One really cool feature shared by the INQ1’s Facebook, Skype and Windows Live Messenger, is the ability to converge contact data from all three services, along with the phone’s own address book. This involves manually linking any duplicate contacts on each of your friend lists, so that, for example, the INQ1 will know that “Joe Bloggs” on Facebook is the same “JBloggs” on Skype, and so on. This is very similar to how the upcoming Palm Pre’s ‘Synergy’ feature will work, although Palm’s implementation looks like it will have a degree of automation, with the device doing some guess work in order to make converging contacts a little less time consuming than on the INQ1. 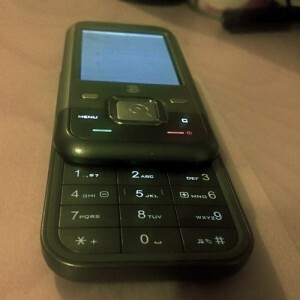 For a phone that has it so right when it comes to social networking, I was a little disappointed by the web browser. It wasn’t the way pages rendered, the ‘full web’ was mostly accessible, but the slow speed at which they were displayed and the clunky scrolling. However, I was very pleased to see the option to switch on ‘smart fit’ so that columns of text re-flow intelligently so as to eliminate horizontal scrolling on the device’s 2.2 inch (320 x 240) screen. There’s also a built-in RSS reader and an accompanying home screen widget too. 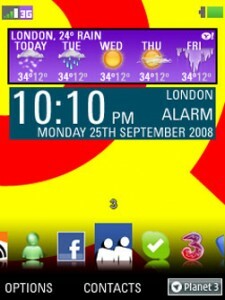 Talking of which, other home screen widgets include a Google search bar, Yahoo Weather and world clock. This is the biggest let down of the INQ1. The 3.2 mega-pixel camera is poor to say the least, which is a real shame considering how easy it is to upload photos to Facebook. With no Flash and weak optics, shots taken indoors really struggle, while well lit or outdoor situations obviously fare better. The INQ1’s music player is pretty basic too, but it gets the job done (let down mostly by the lack of a 3.5mm headphone jack). On the upside is a degree of Last.fm integration, although it’s “scrobbling” of tracks only not actual streaming, and a microSD card slot offering plenty of storage. I don’t have any stats to prove it, but I’ve long believed that 90% of mobile phone owners probably only use about 10% of the device’s features. That’s unlikely to be the case with the INQ1, which not only concentrates on three of the most popular web services – Facebook, Skype and Windows Live Messenger – but integrates them in a very practical and intuitive way. In fact, the INQ1’s UI is incredibly easy to use overall, with the customizable Mac OSX dock-like launcher providing quick access to the most commonly used apps. The major drawback of the INQ1 is the phone’s sub-par camera, something that I feel INQ needs to address as a priority in any future model. Moving forward, I’d also like to see an INQ phone with WiFi, a larger screen, and a QWERTY keyboard, all of which would, of course, add cost, although not so much over time as component prices come down. On the software side, a Twitter client and integration would be an obvious addition, as would support for more IM services. There also needs to be an option to increase the font size in the Facebook app, something that could easily be addressed through a future software update. Overall, however, I’ve found the INQ1 to be one of the most fun phones I’ve played with in recent times, and on a more profound level, points to where mobile communication is definitely heading. All of this from a new entrant and a low-cost device – free with a contract or £80 PAYG on carrier 3 here in the UK – squarely aimed at the masses. Job well done INQ (just fix that camera). Does that mean if you are logged into Facebook all day, you are being charged as being on the internet all day with your phone? Yes it does but… The INQ1 is offered on a pay-monthly tariff on “3” that includes “unlimited” Facebook access and other data. And for PAYG, you’re encouraged to take out the unlimited data package as a top up (£5 per month in the UK, I think). So if done right, you won’t ring up a huge bill at all – it’s pretty good value. I’m still a little confused, however, by how Skype enables free calls on the INQ1, particularly between two INQ1 users in different countries. For instance, if my son and my daughter were each to have a INQ1, and one were in Cambridge, in the UK, and the other were in Melbourne, Australia, would each be able to use their 4000 minutes of free Skype per month to talk to each other using their INQ1s? Alternatively, on of you could be using a PC running Skype with a headset. That would also be Skype-to-Skype. 1. So do I understand it right, that I can call for only 5GBP a month (on Pay As You Go) anybody on Skype anywhere for 4000 minutes a month? 2. I have to top up at least 5 pounds per month right? 3. and I can also play let’s say scrabble (or rather wordscraper or lexulous, I hate Hasbro) for as long as I want? 4. I am basically looking for device I can Skype on and play the scrabble on facebook all the time for as cheap as it gets. Is this it? 5.I can’t get any monthly pay plan since I do not live in UK the whole year around, but only about 5-8 months, and for that it would be worth it I think, but can I then stick some other European sim card in to it, and use it at least like a phone, or will it became dead once I leave UK? Yes. Although as from this month, you don’t even need to top up to use Skype. Not to use Skype, but to use Facebook and other Internet services I think you need a data bundle at £5 per month. No. The mobile version of Facebook does’t work with games as far as I know. Only core aspects of the site. It’s the cheapest for Skype and core Facebook access, including syncing your Facebook and Skype contacts with the phone. 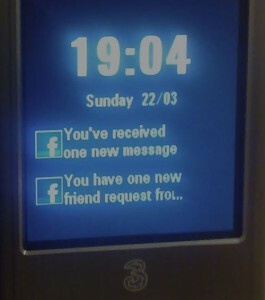 The phone is locked to “3”, so unless the country you are going to has a “3” network then I don’t think you can use the phone. Anyway I was hoping I found something cool, but now I feel like all the hype is just trickery, and since I can’t figure out how much they would charge me for what on their web site, I think I leave this one be…, and wait for company with plain English… maybe forever…, but better than being f…d with, by another corporation… Shouldn’t they expect that on pay as you go it should be crystal clear for what one is paying, since it is going to be evaluated by some uber stingy b…ards like me??? What is the loud speaker part of phone like?